The Iroquois is a group of Native American Indians consisting of the Mohawk, Oneida, Onondaga, Cayuga and Seneca tribes, which was based in what is now Southern Canada and the North-Eastern USA. Corn, as food material, was foundd in an immense area in North and South America. In the Seneca cosmological myth, corn was said to have sprung from the breasts of the earth mother. Corn and cornhusk therefore play an important role in many rituals. Dried husks were used as torches, mattress filling, clotheslines, woven bottles, trays, baskets, mats, sandals and moccasins. 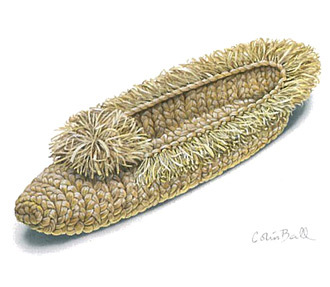 Above plaited cornhusk moccasins were made as funeral footwear for the dead.